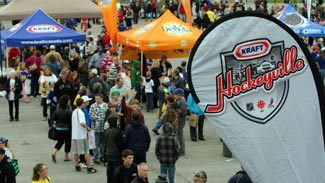 STIRLING-RAWDON, Ontario – Kraft Hockeyville 2012 is already being considered a success, but there was a time when it was nearly over before it got started. Of all things to get this town of about 1,900 revved up for hockey, it took a couple’s wedding nuptials to get people motivated for Hockeyville. "Our first two events, we hardly had anybody out," said Cindy Brandt, the chairperson who led the charge to bring Hockeyville here. "We had a Hockeyville wedding down at the covered bridge then we walked our 'Highway to Hockeyville’ (to the rink) as we called it. Instead of a ring, they passed a Stanley Cup and the bride promised to bring her husband and his friends beer and party snacks for Hockey Night In Canada. "After that, people were like, 'What are these people doing?' Before we knew it, people were phoning us with, 'When’s your next event? There’s nothing on your Web site.’ It just happened that way. I think people bought into it because we were doing odd things just to try to increase awareness." The three-day event started in the morning at the Stirling & District Recreation Centre, which will receive $100,000 in upgrades thanks to winning the Hockeyville contest, with Olympic silver medalist Elizabeth Manley conducting figure-skating classes. Sunday concluded with an alumni game that featured hometown hero Rob Ray, Gary Leeman, Matthew Barnaby and Brad Marsh among others. But for Brandt, who is Ray's sister, having the Stanley Cup on display for pictures for three hours and a parade with the trophy as the centerpiece meant the most to her. "What’s exciting for us is the Stanley Cup being here," Brandt said. "That’s the most exciting part for us, bringing the Cup to Stirling. These kids never get the opportunity to ever see the Stanley Cup, so that’s the highlight for me." The recreation centre, built in 1976, will be dressed up over the next few years, but the biggest thing for Brandt is the addition of girls-only locker rooms. As of now, they are unisex, but that will change soon. "We’re looking at three-phrase (project) with the money that we raised and the $100,000 we received from winning the Kraft Hockeyville," Brandt said. "It’ll put a new front on our arena and we’re on a five-year plan to finish the dressing rooms and have the ability for the girls to have their own dressing room here and make it wheelchair-accessible out front. That’s important for us." There were three overlapping events sprinkled through the morning and afternoon – the skating clinic with Manley, who won her silver at the 1988 Games in Calgary, the parade that rolled down Front Street and concluded at the rink, and a festival in the rink’s parking lot with former NHL players signing autographs and all kinds of games for the kids. Sometimes figure skating can get lost in the shuffle in a hockey town, but that wasn’t the case here. "Liz is just great to have out here teaching these kids because she works so well with them," said Nick Myers, a proud father who was looking on with his wife, Laurie, as nine-year-old Madison took part in the clinic. Myers credited Brand for making figure skating part of the festivities. "I'm very grateful to her for getting the ball rolling on getting figure skaters involved," he said. "The support from everyone has been amazing." There will be more clinics Monday and Tuesday with some of the NHL alumni taking part as instructors. "It's pretty cool," said Todd Binnie, who had a front-row seat on his lawn for his second-ever viewing of the Stanley Cup. "It's a small town so we don't get to see that type of stuff too often." The day concluded with an alumni game in front of about 700 fans packed into the tiny rink that only has seats on one side of the ice. In a town of 1,900, it was impossible to get everyone into the building, so the tickets were instead given to the volunteers who helped with fundraisers and events that led to Stirling-Rawdon winning the Hockeyville contest. Rawdon defeated Stirling in the alumni game 7-4, but the outcome wasn’t as paramount as what these three days will mean. "The last time I was in this building was when I was 14 years old, so 30 years ago," Ray said. "I tell you – it’s a really tiny town, but the people here are obsessed with hockey and it shows. You could’ve sold 10,000 tickets for this game. "It's awesome, because when you're here in small town Canada, sometimes you get forgotten about. You get looked at as a bunch of farmers, that type of thing. They’re not. They proved here that when you pull together, that anything can happen. I think the group that put this together did a fabulous job. They gained momentum and got the ball rolling and I think it showed every small town out there that they should try it out, because anything is possible."